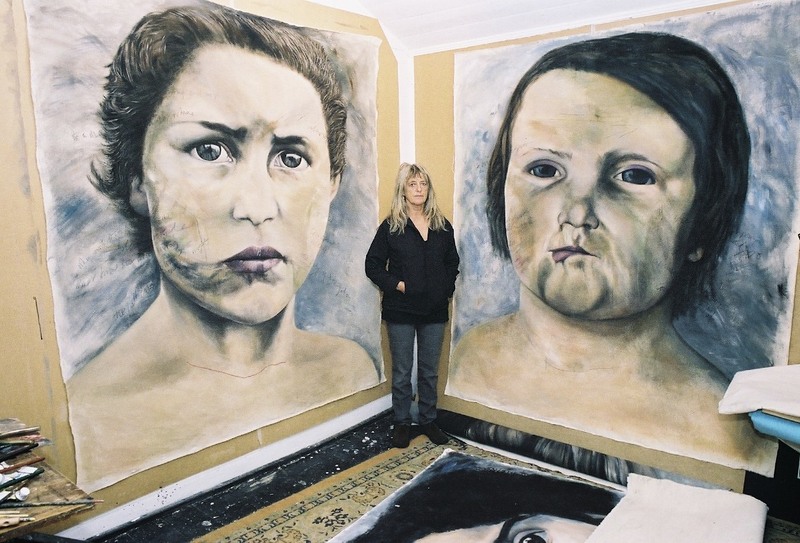 Just in time for the twin apocalypses of a Trump presidency and a hard Brexit, artist and former Crass member Gee Vaucher has put together a retrospective show of her confrontational, politically charged artworks, spanning her entire 50-odd year career. Showing at Firstsite gallery in Colchester, Gee Vaucher: Introspective begins with work from the early 1960s and includes her most recent paintings and drawings, as well as photographic and sound works made in an evolving late-70s New York, where Vaucher worked as a political cartoonist for the New York Times and New York Magazine. The assembled works have been drawn from Vaucher's archive and include collages, paintings, videos, sculptures, prints, drawings, and photography, each revealing her unique aesthetic—an amalgam of Surrealism, Pop Art, and Dada, often executed with the DIY immediacy that she used to shape what we all immediately recognize now as the classic "punk aesthetic." The exhibition includes the now-iconic artworks Vaucher created for Essex's finest commune-dwelling anarcho-pacifist punk band Crass, of which she was a member for the band's entire time together (1977 to 1984). Crass, famously, had a thing or two to say about authoritarianism and right-wing, warmongering, and isolationist heads of state, and with Vaucher at the helm of most non-musical undertakings, they found some ingenious ways to make their point. While their records are fantastic and powerful in their own right, their extracurricular antics could be considered a very mischievous kind of performance art. For instance, during the aftermath of the 1982 Falklands War, Crass used excerpts from speeches by Margaret Thatcher and Ronald Reagan to put together what even now is a very convincing-sounding telephone conversation between the two leaders. They sent tapes of the hoax exchange to the world's press, and it caused a genuine stir. On the tape, Reagan seems to state his intention to use Europe as a battlefront to show the Soviet leaders the US's resolve during a potential nuclear war, and Thatcher admits that HMS Sheffield was deliberately sacrificed in order to escalate the Falklands War. The press took a while to get to the bottom of the story—the tape was convincing enough for people to ask all kinds of questions and for it to appear all over the papers. Even the intelligence services were convinced that either the Soviet or Argentine governments were behind it. Crass was serious about its "culture jamming"; imagine what the band would be capable of if it were around today. You can listen to the tape here. Although Vaucher herself is understandably against labeling her work, it's hard not to call a lot of it "protest art," and hard not to see how it might be relevant—or at least a solid reference to move forward from—in today's sketchy geo-political climate. I asked Vaucher a few questions about her work and life, which she answered frankly and succinctly. VICE: You're doing a career retrospective show—why now? Gee Vaucher: What's a career retrospective show? I don't have a career. A space was offered, and I accepted. I just pulled everything out of the drawers and cupboards. You've said your politicization began with the Aberfan disaster in 1966. Were you making work before that? Yes. Life drawing, portraits, family, life on the streets, etc. There's a self portrait from 1962 in the show. I get the feeling that your work is created quite a long way from the art world, but at the same time, it couldn't be called outsider art. Do you see yourself as a "professional artist"? I don't know what a professional artist is. What do you make of the art world today? Same as I did yesterday. There are the good, the bad, and the mad. Some of your work in the past involved performance—have you made performance work since then? Would you make it again? I use whatever it takes to say what I want to say, so who knows. Full disclosure: I am a Crass fan—your band is very special to me and opened my eyes to a lot of things I wouldn't have come across without Crass, and I'd like to say thank you for that. Is that frustrating or boring to hear, given Crass finished more than 30 years ago? Does it at least comfort you that people fixate on it because what you said and did back then was so powerful? I'm always honored when someone expresses their thanks to Crass. To have given a helping hand to so many is humbling. And yes, the thanks continue, and, for some, Crass is not 30 years ago but only just found. Sadly the world has not changed much and the words, music, and images still resound. Your work is synonymous with what could broadly be called counterculture. Thanks to the wonders of the internet, counterculture is now as accessible and easy to engage in as the mainstream. Does that excite you? I'm still getting to grips with the internet, as are most people of a certain age. I'm impressed and excited at the possibilities of sharing information, but find myself mildly annoyed and dumbfounded at the way the whole digital world has taken over people's lives, especially the phone. I can never take on all the new stuff thrown at me and leave the old behind so completely. The two worlds can inform and balance each other. Are there any efforts within the counterculture today that you're particularly impressed by? I'm sure there would be if I looked, but I'm not a great "surfer" in either sense of the word. "Proud" is a strange word. There are many works I have done I never tire of looking at. I can get such a distance from them I forget I did them. That's a great feeling. I'm very happy to have produced the Children series. Given recent global and national events—the election of Trump, mainly—it could be said that a lot of social progress is being rolled back. What do you think the best approach to addressing this is for young artists and musicians? A direct confrontation of the events in their work, or a broader, more general "politics aside, let's be nicer to each other"–type approach? I've no idea. They must look inside themselves. I feel like your work has been both of these things at different times. Which do you think is more effective today? I've no idea—I don't do work for effect. Are you optimistic about the future? Is your work optimistic about the future? Gee Vaucher: Introspective is open from November 12 to February 19, 2017, at the Firstsite gallery in Colchester. Follow Robert Foster on Twitter.